My "Soar" pinwheel block, example made from a variety of fabrics by designers Bonnie and Camille for Moda fabrics. 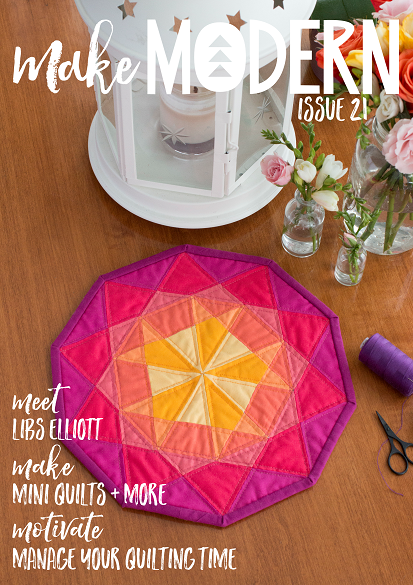 At the start of the year, I was approached by Linden from Vinelines Quilting, and Crystral from Raspberry Spool, to be a guest designer for their year long quilt-a-long, Project 48 Quilt. It's a clever program, releasing a block each week, with half being of a more traditional block style, and the other half featuring modern piecing and techniques. It's been a wonderful opportunity for the 1,600 participants to explore a variety of skills and methods of block construction. Some wonderful examples of the Soar block, as made by participants. Clockwise from top left: @raspberryspool, @susansquiltstudio, @cvanberkel, and @dibracey. I was delighted to create a block that focussed on Pinwheels, which is one of my favourite traditional blocks. I titled my block, "Soar," as I felt inspired by the ability we have to achieve what we set our minds to. I especially notice this more since being a parent. Children have that innocent feeling of freedom, and that the possibilities are endless. Again, further examples of how a block can alter in style depending on the fabrics and colours chosen by participants. Clockwise from top left are: @handmaderetro, @iamkatotron, @sharingthegoodstuff, and @quiltpony. 'Soar,' is a traditional block in method, but as always - the style of a block can be altered dramatically depending on colour and fabric choices. Take a look at these variations of "Soar," all achieved by various members of the Project 48 group. Each block has taken on a whole new personality and style - reflecting the nature of the one who made it. Try making a total of 36 Soar blocks to create a beautiful and striking quilt. The beauty about Soar, is that one block can easily be adapted to create a whole quilt. Here I have shown an example of what could be achieved by creating a total of 36 Soar blocks. Note how I have alternated each block with different red and green fabrics. The simplicity of the prints and colours give a striking effect, and clearly I was intending on a Christmas themed quilt (pictured finished example measuring 62x62") upon designing this pictured example. My goal is to eventually make a Christmas themed quilt (my first! Seriously - you don't need a lot of quilts during Christmas in Australia - it's Summer time!) But as I make my Christmas themed quilt, I am determined to not use Christmas themed fabric. My goal is to use regular everyday fabrics - but create that tinsel-clad holiday feel with the choice of colours. I have very much enjoyed seeing how participants of Project 48 have interpreted the "Soar" block, and if you would like to make one yourself - please check out the Project 48 site for more information.